Pipeline Operator In Calif. Spill Reportedly Had History Of Infractions : The Two-Way Plains All American Pipeline had accumulated 175 safety and maintenance infractions since 2006, according to a Los Angeles Times report. 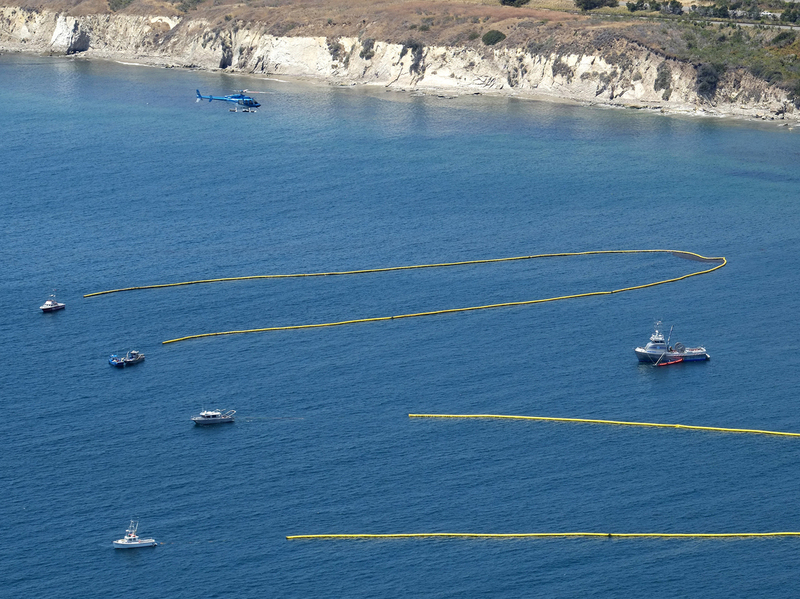 A helicopter coordinates ships below pulling booms to collect oil from a spill near Refugio State Beach, north of Goleta, Calif., on Wednesday. The Texas-based company responsible for the undersea pipeline that has leaked tens of thousands of gallons of oil into the sea near the coast at Goleta, Calif., has a history of federal safety violations, The Los Angeles Times reports. The newspaper reports that Plains All American Pipeline has accumulated 175 safety and maintenance infractions since 2006: "A Times analysis of data from the Pipeline and Hazardous Materials Safety Administration shows Plains' rate of incidents per mile of pipe is more than three times the national average. Among more than 1,700 pipeline operators listed in a database maintained by the federal agency, only four companies reported more infractions than Plains Pipeline." As we reported Wednesday, a 9-mile slick is expected to have a negative impact on some wildlife. NPR's Kirk Siegler reports from the site of the disaster that crews were working around the clock to clean black sludge off the beaches and that at least three vessels have been working to skim the oil off the water. "Gov. Jerry Brown has declared a state of emergency, freeing up money for aid and more environmental response teams," Kirk adds. Greg L. Armstrong, the chairman and CEO of Plains All American Pipeline LP, visited the site of the spill Wednesday. He said the company "deeply regrets" the accident, according to The Associated Press. "We apologize for the damage that it's done to the wildlife and to the environment," Armstrong said, adding that the company has received permission to continue cleanup operations around the clock and "will remain here until everything has been restored to normal."